Recycled bikes for sale at the Time's Up Brooklyn space. 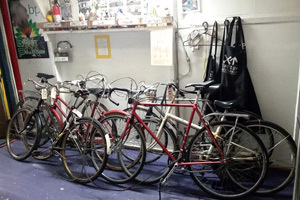 Bikes are available for sale on Sunday and Wednesday evenings from 6:00-8:00pm at 99 South 6th Street in Williamsburg. All proceeds go to support Time's Up environmental organization. Our gallery is on the streets, and we want to share it, pointing out famous and hidden spots. 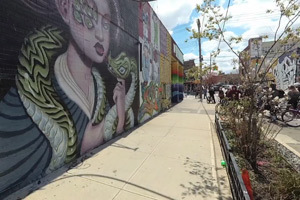 This Jersey City edition of the Street Art Bike ride is in collaboration with CANVS, a streetart/mural app. 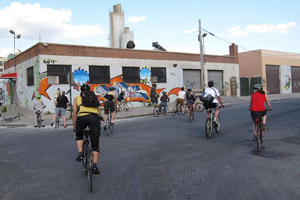 Tour includes Jersey City highlights, history and social implications of street art. 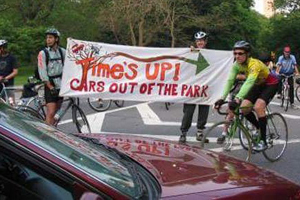 Tuesday, June 26, 6:00 p.m.
School's out for summer, and the cars will be out of Central Park for good! Join with old friends and make some new ones as we celebrate victory in this decades-long, people-powered campaign to peacefully remove internal combustion from Central Park. Our gallery is on the streets, and we want to share it, pointing out famous and hidden spots throughout the city. This ride will be to the Welling Court Mural Project in Astoria, Queens. They are having their annual mural festival on the 9th, so it's great time to see this area. 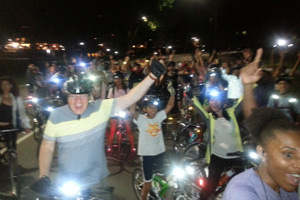 Central Park Moonlight Ride, Friday, June 1st. Meet at 10 p.m., Columbus Circle (SW corner of Central Park). Going strong since 1994! A big victory was recently announced by the city: the Central Park loop roads will become auto-free on June 27th. This is a campaign that Time's Up has been working on for over 20 years. In the past we had successfully gotten entrances and exits closed to the park and reduced car hours but now finally we are getting a total ban of cars from Central Park's loop road. 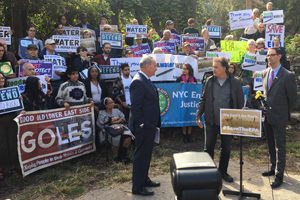 Environmental activists, including Time's Up's founder at a rally with Senator Chuck Schumer at La Plaza community garden to protect the EPA's budget from being slashed 31% by the Trump administration. La Plaza community garden is the vanguard of sustainability in NYC with countless sustainable environmental systems, all created by the people. 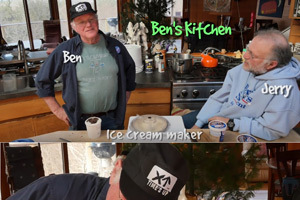 Check out video of Ben with Time's Up hat in his new ice cream release. Ben & Jerry have been huge supporters of Time's Up. Please spread the link and the ice cream!! 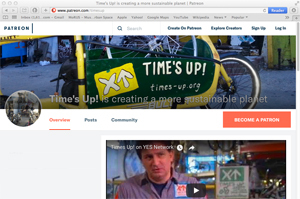 You can now support Time's Up on Patreon: https://www.patreon.com/timesup. 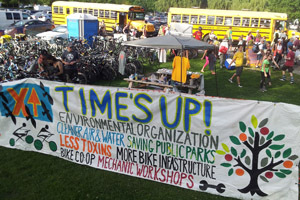 Help save the planet by supporting Time's Up's environmental campaigns, workshops and events with a membership for $2 a month, or become an eco-supporter and help us for $15 a month. We are an all volunteer-run, 30 year-old, direct action environmental non-profit. And we rely on donations from supporters like you.